I discovered Susanna Kearsley's books a few years ago through the utterly wonderful The Winter Sea. It was love from start to finish with that book, and I eagerly checked out a few more of her backlist. I never fell quite as hard with the others as I did with The Winter Sea though, and so when I heard about A Desperate Fortune it didn't automatically zip to the top of my TBR. But then my friend Beth read and loved it and did that thing where she smiles enigmatically and says, "You'll have to tell me when you've read it." Implying that I will. And that it will likely go well. I trust her implicitly. But I am a bit of an uncooperative reading soul these days, and so I knew I would come to it when I came to it. Attempting to force things lately tends to backfire spectacularly. Then the other night I crawled into bed and cast about. As one does. I figured I'd give it a shot. Just the first few pages. Just to see . . .
Sara Thomas has learned how to manage her life. She prefers to work alone when at all possible. She plays Sudoku when she gets anxious. She occasionally meets someone she's interested in seeing more. It lasts a few weeks, and then she ends it before she has to explain why it won't work long-term. She has her beloved cousin Jacqui to point her in the right direction in social situations, or provide her with the necessary reprieve as needed. So when Jacqui comes to her with an intriguing proposition related to one of her famous historians, Sara is interested. Having always loved code-breaking, she takes on the challenge of deciphering the fragment, only to find out the next step is a trip to France and the overwhelming task of deciphering the entirety of a young woman's journal. A young woman from the 18th century. Mary Dundas was born a Scot but raised in France. Her unusual tale takes her from the French countryside to the heart of Paris to the shadow Jacobite court in Rome. And Sara is along for the ride as she moves temporarily into the home of the woman who currently owns the journal and learns to navigate life in a small French village and the kind advances of an unusual family that lives there. I'm such a sucker for a Jacobite Rebellion tale. This likely dates all the way back to Patricia Calvert's wonderful Hadder MacColl, which I read and loved as a kid. It was encouraged on by Jennifer Roberson's Lady of the Glen, which I read and loved as a teen. Ms. Kearsley excels at the time period as well, and her books have been such a delight to discover and love as an adult. As is often the case with a Kearsley book, I fell in love with the characters in the contemporary storyline first. I was fond of Sara instantly, as she matter-of-factly outlined her life with Asperger's, her reliance on her cousin Jacqui's social cues and advice, and her foray into amateur code-breaking as a form of independence in France. It took me a bit longer to warm up to Mary Dundas and her perilous journey. I am known to struggle with a road trip, but as soon as Mary made her way to Paris and took up the reins of her ruse, I fell into her story as well. The introduction of one mysterious Highlander by the name of MacPherson did not hurt in the slightest. As lasting imagery from this novel goes, it is those atmospheric scenes from Mary's life that linger in my mind. The unsettling glow of MacPherson's pipe lighting in a dark room. The tucking of a small dog into a rough cloak as tired feet press on. Two figures standing quietly just inches apart near the bridges of Rome. But my favorite scene of all (which I can't resist quoting a bit of for you here) comes from Sara's story. Sara's and Luc's. "Luc." I felt a sudden weight within my chest, a pressing sadness as I realized he was wanting something more than I could give him; something more than just a simple holiday romance. "I don't . . . I can't . . ." He mattered more than any of the others had, and so it hurt me more to disappoint him, but that only made it more important he should hear the truth. "I can't sustain a real relationship. I always mess things up." I'd meant to state that calmly as a fact, but my voice wobbled on the final words and Luc's own voice grew gentle in response. "How do you mess things up?" In every way conceivable, I could have told him. "I just do." "It might not happen this time." "Yes, it will. It always does. I'm just not capable—"
"Who told you that?" His words, still quiet, cut across my own with an insistence that I simply couldn't bring myself to answer, so I briefly closed my eyes and closed my mind against the memories. Luc fell silent too, and when my eyes came open he was watching me. Not crowding me, but standing close enough that I was very much aware of him. He asked me, "If you could . . . if you were capable of having a relationship, would you want one with me?" "Good. So your plan was that we should spend time with each other, and then you would leave me?" Luc gave a nod, and remarkably I saw the curve of his smile. "What?" I asked. "It's a terrible plan." He came closer. "No, really, you need to revise it. I'll help you." Two lovely, very subtle romances thread their way through the dual timelines. I found myself immeasurably charmed by both of them. The pacing on the whole is quite slow, languorously so. But my interest and attention never flagged. It merely meant my consumption of the novel was a more leisurely and relaxed affair—an experience I thoroughly treasure. Susanna Kearsley's books always feel like the warmth of a fire on a winter night to me. 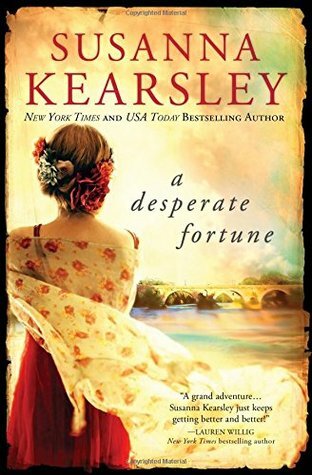 If you find yourself with a few hours to spend on a cozy evening in the near future, I can't think of a more enjoyable read to tuck in with than A Desperate Fortune. I'll be gifting it this holiday season for sure. The Bookpushers - "Most romantic ending I’ve had the pleasure of reading." Dear Author - "It is a book which invites one to slow down and wallow. To roll the language around on your tongue as if tasting a fine wine and to savour the experience along the way." Harlequin Junkie - "This story goes well beyond just your average, every day women’s fiction." Rhapsody in Books - "Both romances are quite moving."